The winner for Part two of November’s competition, Paracaleana minor (Little Duck Orchid) was David Manglesdorf. In South Australia, though much smaller than its big brother – Caleana major, it still suffers from similar problems ie lack of pollinator, vulnerable status, extremely limited distribution within the Southern Lofty region. The Little Duck is widespread in the east extending from Queensland down around into the South East, as well as across to Tasmania, plus one other distant location. One of the differences between the two species is that the minor is able to set seeds without insect pollination occurring. Could this possibly help provide an explanation for its other location? Just some food for thought as to how plants may spread around the world – but it still doesn’t take away from the fact that it is also another one that cannot be cultivated and needs to protected where it naturally grows if we are to continue to enjoy this species. Department Of Environment And Heritage. 2008. Paracaleana minor: Small Duck-orchid. Adelaide and Mount Lofty Ranges South Australia: Threatened Species Profile, May 2008. Jane, G. 2006. Caladenia alata at Rainbow Mountain -Dispelling a Myth. [online] Available at: http://www.nativeorchids.co.nz/Journals/98/page17.htm [Accessed: 7 Feb 2014]. 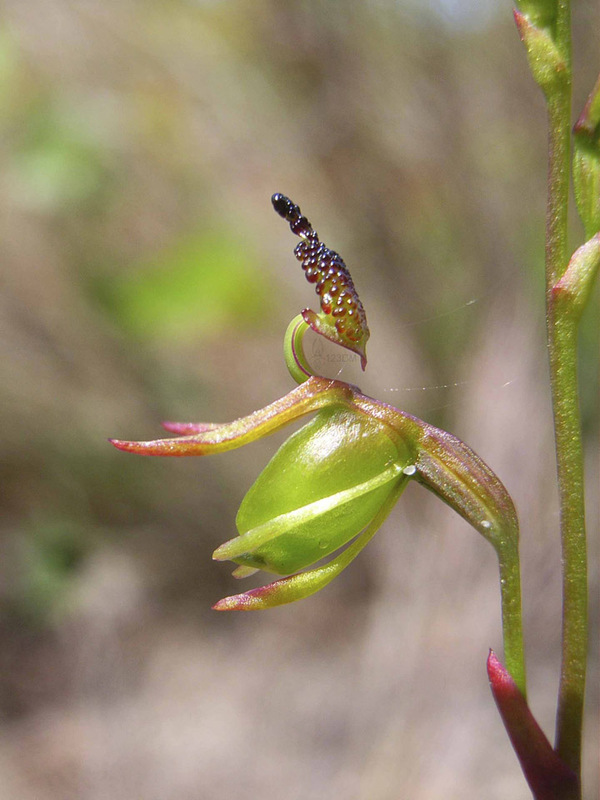 This entry was posted in Monthly photo competition, Orchid Identification and tagged Duck Orchid, photography. Bookmark the permalink.